In the last year, video content has seen it’s a sudden rise in the marketing industry. And the reason it’s getting much attention because it’s extremely goal oriented, direct and authentic in nature. In the marketing industry, consumerism is much dependent on trust so when the audience gets to see what’s behind the screen of the hard selling business men they develop a sense of trust. Jim Johnson, Vice President, Account Planning, Exponential, said, “2018 was the year of personalization. Marketers focused on customizing content based on the viewer’s interests, increasing brand loyalty and engagement. With 2019 on the horizon, we are seeing a greater shift towards custom and personalized video experiences in video marketing.” Johnson believes that video marketing has given preference to viewers likes, dislikes, and interests that’ll boost ROI and brand engagement. “Video advertising will continue to be amplified in the new year, in combination with the benefits of emotional impact, interactive functionality, and storytelling,” he added. If you’re just starting out with video marketing and looking for some marketing strategies, these tips are your go to! Tell a compelling story - As the marketers are well versed with some marketing terms and strategies, the audience might not be sound with that information. So, if you’re planning to disseminate some good quality content always have a reference story in mind. Thoughtful storytelling evokes emotions among the audience. Quality over Quantity - Always remember grabbing the audience’s attention is crucial but that doesn’t mean you keep spamming their timeline with content all over the places. Have a planned structure of your postings and content. Keep your content short and script - For a high-quality video content always keep a certain time frame in mind. Script your video in a way which is highly relevant but also at the same time crisp and short in nature. If the topic is wide and multidirectional, plan a series of videos which also create a hype among the targeted audience. Go Live - It’s very important to interact with your audience in marketing so that they feel they secure doing business with you. Once in a month or so, you can plan a live series or a live QnA session with the audience. Not only it boosts interaction but also the consumers feel a notion of trustworthiness in you. Even 360 degree live videos have become very popular across the internet, so in case if you’re planning for some hard packed action content always go live! Educate, Entertain and Inform - The most effective way to implement a quality video content is to enrich the audience with information, education along with entertainment. Only then it’s relevant and shareable content. Have a fun way of pitching your content, add humor and emotions to your content and there you go! 2019 is the year of ‘Video Marketing’ and there’s still a huge opportunity to learn and grow. 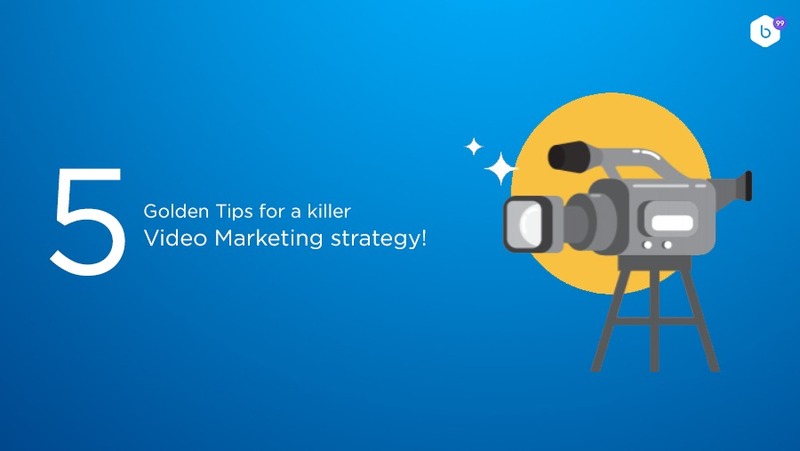 With these absolute banging tips in your mind, you’re all set to nail the video presentations. Use social media to boost your engagement, and always keep evolving with time. Have you included video marketing into your content strategies? Tell us all in the comments below!